A Great Big World is an American musical duo from New York made up of singers and songwriters Ian Axel and Chad King and signed to Epic Records. The group is best known for their singles "This Is the New Year", which was performed by the cast in an episode of Glee and reached the Billboard Mainstream Top 40 chart in May 2013, and their international hit "Say Something", particularly after recording it as a duet collaboration with Christina Aguilera. Ian Axel and Chad King met at New York University, where they were attending The Steinhardt Music Program. Both were music business students and Axel is said to have convinced King to write a song together. King agreed to work with Axel after hearing him sing. They both wrote and performed songs together prior to Axel embarking on a solo career in which he released an independent album featuring songs that were all co-written by King. In 2011, their song This Is the New Year was licensed to various television networks and was used as the theme song for MTV's I Used to Be Fat as well as being featured on The Amazing Race, ESPN, One Tree Hill, and Good Morning America. 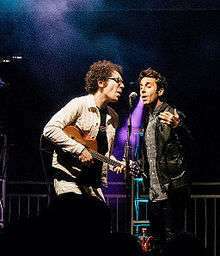 Ian Axel and Chad King went on national tour and performed as the openers for Ingrid Michaelson, Matthew Morrison (Glee), and Five for Fighting. The duo re-branded itself in 2012 which is when they took the official name A Great Big World. They released a six-song EP after obtaining funding from the crowdsource funding website Kickstarter. In 2013, This Is the New Year was performed by the cast in an episode of Glee. In 2013, the group signed with Epic Records and released a three-song EP under the Epic label in May 2013. They completed a headline tour in conjunction with their EP release. Their song Say Something was featured in the final episode of the US dance competition So You Think You Can Dance on September 3, 2013 and released digitally the same day. It climbed to number 20 on iTunes in the United States the next day. The song was subsequently re-recorded featuring Christina Aguilera after she heard the song, and this version was released on November 4, 2013, and that version reached number 1 on the iTunes charts. The following evening, A Great Big World and Aguilera gave the premiere live TV performance of the song on the NBC television series The Voice. The song reached No. 1 on the digital song chart the next day with 189,000 copies sold for the week. The video was released on November 19, 2013. In November 2013, it was announced that A Great Big World would be performing at the annual Victoria's Secret Fashion Show. The same month, they performed for the first time at the American Music Awards with Aguilera. Their debut album, Is There Anybody Out There?, was released on January 21, 2014. The group made an appearance on the song "Over You" on Ingrid Michaelson's 2014 album, Lights Out. On April 21, 2015 it was announced through the A Great Big World Facebook page that Ian and Chad were working on a second album. The group announced the release of their first single off of the new album via Instagram in mid-July. The single "Hold Each Other" was released on July 22, 2015 featuring the rapper Futuristic. The non-rap version was released on July 24, 2015. The album was released on November 13, 2015 with the title When the Morning Comes. While visiting the UK in June 2015 they recorded at Sarm Studios in London. Several musicians and producers collaborated on the album including Dave Eggar, Derek Fuhrmann, Gregg Wattenberg, Greg Holden, Kevin Kadish, Josh Kear, Dan Romer and Mozella. They have been writing a musical for several years. The show is about family and is called Strokes of Genius. — 39 — — — — — — — — Is There Anybody Out There? "Where Does the Time Go"
"—" denotes a single that did not chart or was not released in that territory. ↑ Lovett, Matthew (23 May 2013). "Preview: A Great big World At Rumba". Columbus Alive. Retrieved 4 June 2013. ↑ Caulfield, Keith (17 May 2013). "Bubbling Under: Passenger's Worldwide Ride Continues". Billboard Magazine. Retrieved 4 June 2013. 1 2 3 4 "A Great Big World To Release Three Song EP May 21". Rock Revolt Magazine. 4 May 2013. Retrieved 7 May 2013. 1 2 Gibson, Yolanda (7 May 2013). "A Great Big World Is Making Moves This New Year". Examiner. ↑ "A Great Big World To Release "This Is The New Year" on May 21". Artist Direct. 10 May 2013. Retrieved 4 June 2013. ↑ Pikka (2 May 2013). "Great Big World". Annex Magazine. Retrieved 7 May 2013. ↑ "A Great Big World feat. Christina Aguilera, 'Say Something'". EW.com. November 3, 2013. ↑ Kathleen Perricone (November 1, 2013). "Christina Aguilera Duets With A Great Big World on 'Say Something'". RyanSeacrest.com. ↑ Keith Caulfield (November 13, 2013). "Eminem Debuts at No. 1 on Billboard 200, Celine Dion and Avril Lavigne in Top Five". Billboard. ↑ Robert Pace (November 19, 2013). "World Premiere: 'Say Something' Music Video". ETonline. ↑ Jason Lipshutz (November 24, 2013). "A Great Big World, Christina Aguilera Combine To 'Say Something' At American Music Awards". Billboard. ↑ "A Great Big World on Twitter: "Recording @SarmStudios in London today. New music is cominggggg"". Twitter.com. 2015-06-13. Retrieved 2015-08-10. ↑ "A Great Big World on Twitter: "Working with the incredible @daveeggar on some new music!"". Twitter.com. 2015-07-10. Retrieved 2015-08-10. ↑ "A Great Big World on Twitter: "Making some magic with these guys @DerekAEF #greggwattenberg #agreatbigalbum "". Twitter.com. 2015-06-07. Retrieved 2015-08-10. ↑ "A Great Big World on Twitter: ". @Dan_romer is totally blowing it "". Twitter.com. 2015-05-26. Retrieved 2015-08-10. ↑ "A Great Big World on Twitter: "Just finished writing a beautiful song w/ @mozellamusic. Can't wait to share what we've been working on with you all. "". Twitter.com. 2015-04-16. Retrieved 2015-08-10. ↑ "Chad King of A Great Big World discussing about loving a man". Out. 14 August 2015. Retrieved 2 September 2015. ↑ "A Great Big World – Chart history: Billboard 200". Billboard. Prometheus Global Media. 1 2 Hung, Steffen. "Discography A Great Big World". Australian Charts Portal. Hung Medien (Steffen Hung). Archived from the original on 2015-01-23. 1 2 Hung, Steffen. "Discographie A Great Big World". Austrian Charts Portal. Hung Medien (Steffen Hung). ↑ "A Great Big World – Chart history: Canadian Albums". Billboard. Prometheus Global Media. 1 2 Hung, Steffen. "Discography A Great Big World". Swedish Charts Portal. Hung Medien (Steffen Hung). ↑ "A Great Big World - Official Charts Company" (select "Albums" tab). Official Charts Company. Retrieved March 21, 2014. ↑ "Upcoming Releases". Hits Daily Double. HITS Digital Ventures. Archived from the original on October 29, 2015. ↑ "A Great Big World – Chart history: The Hot 100". Billboard. Prometheus Global Media. ↑ "A Great Big World Album & Song Chart History - Adult Pop Songs". Billboard. Prometheus Global Media. Retrieved April 25, 2016. ↑ "A Great Big World – Chart history: Billboard Canadian Hot 100". Billboard. Prometheus Global Media. ↑ Hung, Steffen. "Discography A Great Big World". Irish Charts Portal. Hung Medien (Steffen Hung). ↑ "A Great Big World – Chart History: Japan Hot 100". Billboard. Prometheus Global Media. Retrieved April 25, 2016. ↑ Hung, Steffen. "Discography A Great Big World". New Zealand Charts Portal. Hung Medien (Steffen Hung). ↑ "Official Charts Company". officialcharts.com. ↑ "Adult Top 40 : Aug 17, 2013". Billboard. Prometheus Global Media. Retrieved July 10, 2016. ↑ Trust, Gary (September 1, 2014). "Ask Billboard : Taylor Swift Out-'Shake's Mariah Carey". Billboard. Prometheus Global Media. Retrieved September 2, 2014. ↑ "ARIA Charts – Accreditations – 2014 Singles". ARIA.com.au. Australian Recording Industry Association. Retrieved March 5, 2014. ↑ "Certified Awards Search: A Great Big World" (To access, enter the search parameter "A Great Big World" and select "Search by: Keyword", with the other two set to "All"). British Phonographic Industry. Retrieved 2014-04-04. ↑ "Canadian digital download certifications – A Great Big World – Say Something". Music Canada. ↑ "NZ Top 40 Singles Chart". Recorded Music NZ. Retrieved March 8, 2014. ↑ "This Is the New Year - A Great Big World". Vevo. Retrieved November 13, 2015. ↑ "Say Something - A Great Big World". Vevo. Retrieved November 13, 2015. ↑ "Already Home - A Great Big World". Vevo. Retrieved November 13, 2015. ↑ "I Want a Hippopotamus for Christmas - A Great Big World". Vevo. Retrieved November 13, 2015. ↑ "Hold Each Other - A Great Big World". Vevo. Retrieved November 13, 2015. ↑ Platon, Adelle (February 22, 2016). "A Great Big World Delivers Stunning 'Oasis' Video (Premiere)". Billboard. Retrieved February 22, 2016. ↑ Hoffman, Ashley (July 25, 2016). "Exclusive: Watch A Great Big World's Empowering New Music Video 'Won't Stop Running'". Time. Retrieved August 21, 2016. ↑ "Where Does the Time Go - A Great Big World". Vevo. Retrieved October 22, 2016. ↑ Brown, Laurel (May 1, 2014). "2014 iHeart Radio Awards: Full winners list". zap2it. Retrieved February 28, 2015. ↑ "2014 NewNowNext Awards winners". Logotv.com. Viacom. Retrieved 4 March 2015. ↑ Brown, August (February 8, 2015). "Grammys 2015: A Great Big World wins in best pop duo/group recording". LA Times. Retrieved 4 March 2015. Wikimedia Commons has media related to A Great Big World.